Since 1996, the General Foundation of the University of Valladolid is responsible for the organization and management of all education-related activities which are not presented in the official study plans of the University of Valladolid. The foundation prepares the students for their post university career. 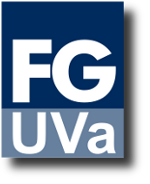 FGUVa offers students and graduates, as well as cooperating companies, the possibility to customize their education by following a program that best suits their needs. The main goal is to enhance the skills and abilities of the students to give them the capacity and needs to find and maintain a suitable employment regarding their qualifications. The main activities are the development of education strategies that facilitate the employability of the graduates of the University of Valladolid; to give advice and develop training strategies for companies and organizations that implement courses of professional perfectionism using resources of the University of Valladolid; to give occupational, specialized and master courses and conduct an inventory of resources of the University of Valladolid, which could be used to give services to companies and entities. Click here to go to the Foundation's website.